Meet RAFAELA. 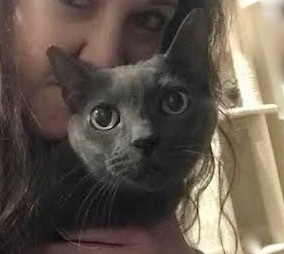 She is a 10 year old RUSSIAN BLUE mix female that we took into our shelter after her owner died leaving her and her feline housemates homeless. Rafaela is a SWEET girl who loves ATTENTION and is TALKATIVE. She’s also FRIENDLY and OUTGOING. She’s a GOOD kitty that gets along well with other cats. One of Rafaela’s ears has been tipped, which we feel adds character! Rafaela can be visited in her foster home in Connecticut. Arrange to meet her. She is spayed, UTD on shots, and FIV/FeLV negative.